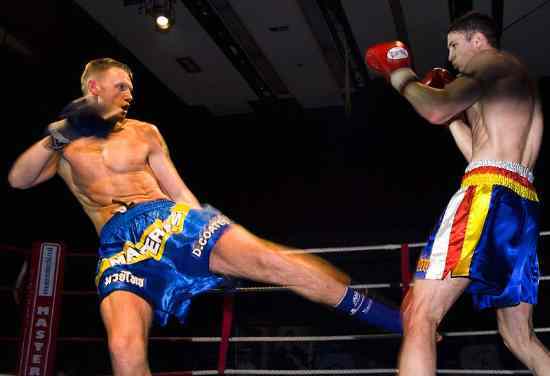 Muay Thai vs Kickboxing: which style is more effective in a fight? Muay Thai vs Kickboxing: thanks to films like "Kickboxer" many people consider them to be the same martial art. That's not quite right. In this post I will try to explain why they're not and then compare both styles. In this post I will focus on American style kickboxing. In both sports, you use your fists for punching and your legs for kicking and...that's about it. OK, I may be simplifying a bit but these two martial arts don't have as much in common as you would expect from watching classic Van Damme movies. American Kickboxing is in many ways much more similar to Karate than to Muay Thai. Some sources even refer to it as "Karate with boxing gloves". Both styles - Kickboxing and Muay Thai - meet halfway in K1/Glory formula which is dominated by Dutch Style Kickboxing. First and foremost: there is No clinch game and neck wrestling in Kickboxing. This greatly reduces possible ways of hurting or finishing your opponent in a close combat situation. Clinch techniques give you a chance to strike with your elbows, to attack with your knees and to throw your opponent on the ground. Which brings me to #2: kickboxing doesn't allow knee strikes or elbow strikes. There are no techniques to control your opponent's posture by grabbing his neck or his head. There's also no leg sweeps. #3 Kickboxing underutilize leg kicks. Leg kicks are a great tools for wearing your opponent down and crippling his movement. Kicking an opponent's legs makes him less agile and slows him down. That is why this technique is used so often by Thai fighters. K1 federation has introduced a cross version of kickboxing and Muay Thai in which leg kicks are more often used and knee strikes are allowed. No clinch work or elbow attacks are permitted thought. #4 More versatile striking. Apart from leg kicks Muay Thai utilize push kicks, a round kicks and other types of kicks which are unavailable in ickboxer's arsenal. #5 Muay Thai employs bit different punching techniques and employs special strikes like a Cobra punch. Apart from that Modern Muay Thai utilizes same Western Boxing techniques. #6 All Muay Thai kicks are delivered with a shin, which makes them more powerful and decreases a risk of an injury for a kicker. Kickboxers kick with a foot, which gives them a slight reach advantage but may cause a foot injury. This may happen when the opponent checks the kick with his shin or a knee. A foot may also get injured when hitting a hard bone like knee or a pelvis. #7 Different stance. Muay Thai stance is lighter, with less pressure on a front foot. This allows the fighter to stand more firm on the ground and be less vulnerable to leg sweeps. Since there are no leg sweeps in kickboxing, this technique is useless for kickboxers. #8 Footwork: Muay Thai fighter is rather walking and 'sliding' than 'jumping' like an old school kickboxer. This makes Thai stance more stable and the fighter is less prone to be knocked down by a push kick [a theep] or swept down by a leg kick.